CHICAGO (Reuters) - United Airlines plans to change the way it schedules flights and to use new technology to tackle the delays and cancellations that have hurt its competitiveness, company executives told Reuters. The new initiatives aim to narrow the gap in performance between United Continental Holdings Inc <UAL.N> and Delta Air Lines Inc <DAL.N>, which has the best on-time record of U.S. airlines. They reflect a broader effort by United to boost customer and investor confidence following high-profile glitches that halted flights twice this summer, causing widespread delays. 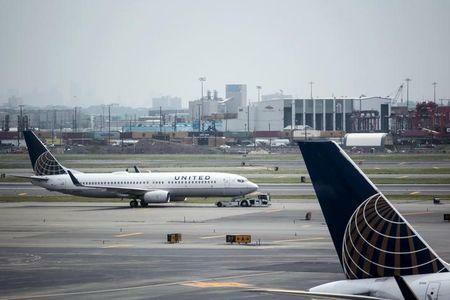 United plans in January to alter its schedules to resemble the way rivals circulate planes through their networks, Vice President of Network Operations Tracy Lee told Reuters. Lee declined to elaborate on the changes but said they could result in an immaterial decrease in capacity because some planes could spend fewer hours in the air. About 75 percent of United flights arrived on time in the first half of this year, according to the U.S. Bureau of Transportation Statistics, the worst record among the four largest U.S. airlines. Delta had about 84 percent of its flights arrive on time, while Southwest Airlines Co <LUV.N> and American Airlines Group Inc <AAL.O> each had on-time arrival rates of about 78 percent. Many of Chicago-based United's flights originate in hubs that are congested or often hit by winter storms. "Delta is running a very good airline, and I want to equal that," Lee said. United grew revenue nearly 5 percent from 2012 through 2014 to $38.9 billion, while Delta has grown revenue twice as fast to $40.4 billion. United, the world's second-largest airline by capacity, is investing in back-end technology and training to quell risks, Chief Information Officer Linda Jojo said in her first media interview since taking over the airline's top technology job in 2014. United is also developing new systems to get flights to their gates and off the ground faster. The carrier started a trial this spring of an automated system, built in-house, to tell agents to prolong boarding so passengers with tight connections can make their flights, she said. "We know your plane landed," she said. "How can we use data and analytics to actually hold that door open for you?" The move saves United the costs of rebooking. Later this year, United plans to test tracking devices embedded in badges worn by those who clean the planes, which would alert gate agents when the aircraft is ready to board, Jojo said. That could shave minutes off the time planes spend on the ground. Jojo said United is taking additional steps to defend against cyber attacks. The airline has not suffered a breach of its data systems, except for isolated cases in which hackers accessed mileage accounts by guessing a customer’s weak password or using passwords leaked elsewhere. United tested the methods that hacker Chris Roberts said he used to gain access to a United flight’s controls through its entertainment system, she said. The U.S. Government Accountability Office in April called for further investigation into whether flight controls could be accessed remotely via other data systems.